Two blog related papers on the Indian economy here and here suggest that there is less to the booming economy than you might think. Both suggest that the idea of the BRICS surpassing the US economy's global influence is an exaggeration, to say the least. The Great Depression led to a need to rethink the principles of central banking, as much as it had led to the rethinking of economics in general, with the Keynesian Revolution at the forefront of the theoretical changes. This paper suggests that the role of the monetary authority as a fiscal agent of government and the abandonment of the view of the economy as self-regulated were the central changes in central banking in the center. In addition, in the periphery central banks changed to try to insulate the worst effects of balance of payments crises and the use of capital controls became more common. Marriner S. Eccles, in the United States, and Raúl Prebisch, in Argentina, are paradigmatic examples of those new tendencies of central banking in the 1930s. Jesus loves you more than you will know (wo, wo, wo) ...I know, but I was going to talk about the other Mrs Robsinson, Joan Violet (née Maurice), the main disciple of Keynes,* as I had promised in a previous post. 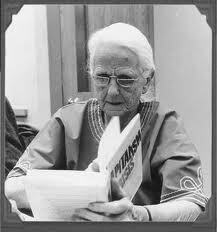 Joan Robinson's contributions to economics demand several posts. She has participated, as Maria Cristina Marcuzzo noted, in three Revolutions, namely: the imperfect competition, the Keynesian and the capital debates ones. And to reduce her to those three one has to fit her contributions to growth theory into a subcategory of either the Keynesian Revolution (the extension of the Principle of Effective Demand to the long run) or the capital debates (the critique of mainstream growth theory), and omit her various other contributions to monetary theory (e.g. endogenous money and the circuit), methodology (e.g. 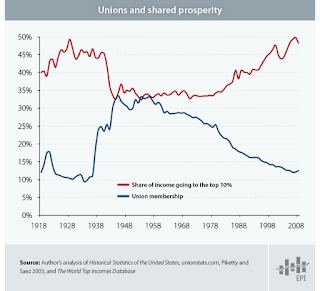 history vs. equilibrium), Marxist economics and so on. She was prolific for sure. 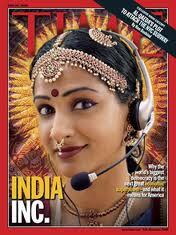 There are several great reviews of her contributions in all of them, which would make my post irrelevant. But what I want to discuss is the point raised in Sergio Cesaratto’s presentation, that in the last one of those revolutions her contributions might have been seen as negative. In his exposition Sergio emphasized quite correctly her rejection, at least in certain contributions, of the notion of long term normal equilibrium positions, and, hence, the traditional method of economics. This was done, for the most part, to emphasize the notion that history matters and that path dependency was important, since the process of reaching the equilibrium would affect the equilibrium itself. Arguably, the role of uncertainty, following Keynes and some post-Keynesians, played a role in her rejection of normal equilibrium positions. Path-dependency is indeed an important feature of real economies, and Robinson was quite right in emphasizing its relevance.++ However, the fact that the normal or long run equilibrium positions might depend on the initial conditions and on the trajectory to its final position would render the very notion of equilibrium irrelevant for the analysis of real historical situations might not be granted. In her view, the notion of equilibrium originated from a misleading mechanical analogy with movements in space, and shouldn’t be applied to movements in time. However, nothing suggests that the long run position of equilibrium cannot be path dependent and actually represented by an equilibrium position. Let me suggest that the idea of the supermultiplier is, for example, a case in point. Output depends on the autonomous components of demand, and investment, as derived demand, behaves in a way which leads to the adjustment of capacity (supply conditions) to demand. It is an equilibrating process, but not a unique one, or one that leads to a determinate path of accumulation, since alternative initial conditions (e.g. sizes of the relevant coefficients) lead to different outcomes. Also, changes in several factors can affect the trajectory by which capacity adjusts to demand. Further, uncertainty, or true, fundamental and non-probabilistic uncertainty was also a relevant component of Robinson’s critique of equilibrium positions. Uncertainty also suggests that historical processes are complex and could not be reduced to equilibrium analysis. This was also in line with the post-Keynesian developments in the 1970s, by Paul Davidson and others, that suggested that uncertainty was central for Keynes understanding of the functioning of the economy. That is again true. Uncertainty was important for Keynes, and is central in the functioning of real economies. However, uncertainty does not preclude the use of equilibrium. Uncertainty implies that agents use conventions, rules of thumb in order to make decisions. In an uncertain world agents stick to social norms, and even if there is significant uncertainty on an individual basis, the institutional framework tends to reduce uncertainty. In that sense, for example, the New Deal reforms decreased to a great extent the degree of uncertainty in the functioning of the economy, and guaranteed a high degree of stability to workers. Another example of how institutional framework would reduce uncertainty is the use of capital controls (and fixed but adjustable exchange rates) to reduce the pressures on interest rates during the Bretton Woods era. With that framework, fiscal expansion with low real rates of interest produced a normal equilibrium with low unemployment level. In other words, nothing implies that uncertainty suggests that the multiplier and accelerator processes are not operational or that normal positions of equilibrium cannot be achieved. In my view, the two main problems to Joan Robinson’s critique of the equilibrium method in the latter part of her career are that, on the one hand, by emphasizing the independence of the investment function and of uncertainty it led to the development of a set of models (later incorrectly referred to as Kaleckian) that bring back the entrepreneur as the central figure in economic growth (the so-called profit-led regimes). On the other, and even more problematic, it took place at the same time that (as noted by Garegnani) the mainstream rejected the old notion of long term equilibrium, and started to use dominantly the intertemporal models (this ones in fact terrible mechanical analogies to movement in space). The old classical (and indeed even the old Marshallian) notion of normal positions, which allowed for historical contingency and path dependency was abandoned by the mainstream, but that was seen by several heterodox authors as an improvement because now mainstream models were ‘capable’ of incorporating multiple equilibria and instability. In fact, Keynes point was that normal situations (and hence stable equilibrium positions) in capitalism were sub-optimal. And Joan Robinson, at least in part, is responsible for some of those heterodox (very confused) views of the development of the mainstream. * Richard Kahn would be the other candidate, but his contributions to the Keynesian Revolution were considerably less visible, if admittedly incredibly important, with the formalization of the multiplier on the top of the list. Kalecki and Kaldor, although quintessential Keynesians, were not disciples of Keynes in a direct way, and Sraffa, although personally close, and contrary to what some think, very favorable to the idea of effective demand, was not a disciple proper either. ++ Note that path-dependency is not exactly the same as hysteresis, a point raised by Mark Setterfield. I’ll expand on this on another post. PS: A paper in which some of the pros and cons of Robinson's approach to economics, in particular on money and growth, is available here (subscription required). Here the rest of the debate with Robin Pope. Esteban Pérez responds to most questions. Political scientists invoke something called the Overton Window to describe the range of possible political conversations. Forget for the moment that the political right is trying to control this window. I want to discuss a different 'Overton Window,' one which involves the possible conversations around truly radical, even exotic, energy sources. A small group of economists, including me, believe that much of what is to be understood in growth and development has a large energy component. So possibilities to radically change the supply and cost of energy causes great consternation. But moving the conversation window even a tiny bit will have great benefits. Geographically for me, it is truly ironic that in 1989 Professors Pons and Fleischman were tarred and feathered and ridden out of town on a rail over their forced, though admittedly premature, assertion at a University of Utah press conference of low energy nuclear reactions, a.k.a. 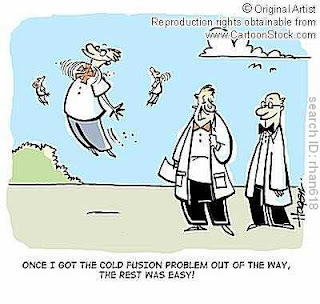 cold fusion, in their laboratory. Well, some two decades later several very serious, very credible, scientists have come out of the closet in support of the so-called FP discovery. Scientists from MIT, NASA, and, especially, the US Naval Research and Development arm (SPAWAR), based in San Diego. If you have an open mind, some scientific aptitude, and a life-changing hour, try this. If you want to discuss it, I can follow some of it and guide you, especially around the implications of the high-energy neutron depositions. This is very good and careful science. Further, at least a half dozen known commercial ventures are underway, one of which (Broullin) received $2 million in venture funding this week. Another, the Andrea Rossi E-Cat project, reports just this week self-sustaining 600C output from their current reactor. The implications of this, if supportable, are profound in two senses: self sustaining implies both electricity output and infinite over-unity possibilities. Now this sounds all very speculative and even specious, and you may question why it even appears on an Econ blog. Fairly simple in an Overton way: as my research and dissertation leads me to believe there is no more important component of an economy than its energy availability and consumption, these discoveries are game changers, and Economists should try to understand, discuss, and even model the implications. I will leave it there for the moment. So, if true, we are on the cusp of a radical energy transition. One which 'fixes' global warming and changes all of our Economic growth models. Not a bad time to be an economist. Or a human. Put away your tars, feathers, and rails. The election in Greece this weekend, and the possible victory of Syriza, the left of center party that is against the austerity measures that are attached to the bail-out program negotiated with the troika of the European Union (EU), the European Central Bank (ECB), and the International Monetary Fund (IMF), but wants to remain within the euro, has prompted fears of a final collapse of the euro. Let me say that irrespective of whether Greece will be forced out or not of the euro, policies to reverse the austerity imposed so far will be needed. Latin America has extensive experience with external crises, and with defaults and devaluation, the Argentinean crisis of 2001-2 being the most recent and dramatic example. Here are some lessons and a short proposal based on these experiences. "When you have convinced the world, that an established system ought to be corrected, it is not very difficult to persuade them that it should be destroyed." A debate on the euro crisis in another blog, which I forgot to report. It's been a while since I have posted. I have a few other things going on, mainly working on finishing my dissertation. I did successfully defend my topic on May 1 (! ), and have an awesome committee that understands how to constrain the output in the right way. So, mea culpa, and here is the first in at least a couple of energy-related posts. 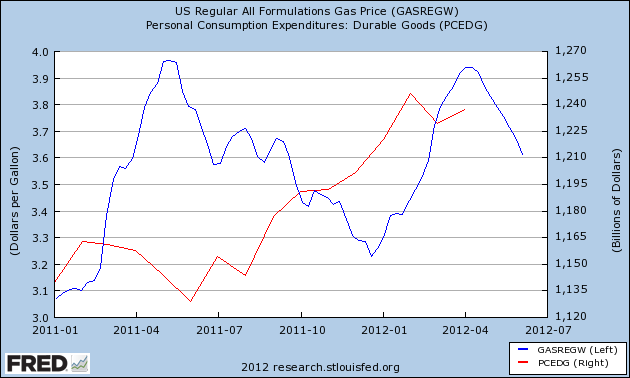 As gasoline prices spike, consumer durable spending decreases. And vice versa. 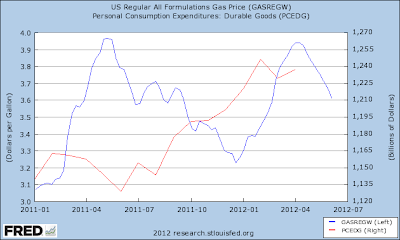 The widely recognized soft spot in 2011Q1 is seen here as a run up in gas prices and a decrease in consumer durable spending. We seem to be seeing a similar pattern this year, though consumer durable spending appears already to be recovering. If I have any short term hope for this economy, this graph is its parents. If gasoline prices continue decreasing, PCEDG will increase and help the economy grow. And vice versa. The mechanism operates because gasoline expenditures are very price inelastic in the short run, and consumers are budget constrained. More spending on gasoline, less on durables, and most of those are manufactured in the US, so it depresses economic performance. This is a very demand-oriented story. And, this is probably the most fundamental short term dynamic for US growth and the November election. And it is largely out of the control of the politicians. I will shortly update a post I did a while ago on radical energy solutions that are in the pipeline and promise to break this link between energy/gasoline prices and US economic performance. This post hints at why that break will be so important. If you were concerned about the defeat of the recall of Governor Walker in Wisconsin, well here is one more reason for you to panic. The Economic Policy Institute (EPI) has just published its Economic Snapshot. "Available evidence suggests that fi scal austerity is not helping restore economic growth or debt sustainability; countries that made the biggest spending cuts to reduce fiscal deficits have seen their debt-to-GDP ratios rise even further (see figure)." The graph shows that higher primary surpluses (difference between revenue and spending, excluding financial payments) are correlated with higher level of public debt. The reason﻿ is that austerity reduces the level of activity and depresses revenues as you would expect according to Keynesian principles. I think increasingly we have an analogy with evolution and creationism in the debate about the effects of austerity. Logic and evidence are clearly on one side, but belief, well that goes in any direction. The problem is that beliefs, ideology, and vested interests have an impact on policy. Krugman notes today that Reagan was a Keynesian. And in a sense he is correct. The fact is that Republicans, at least since Ford, have been the Keynesians, or the party of Big Government if you prefer, while Dems since Carter have been the small government party. 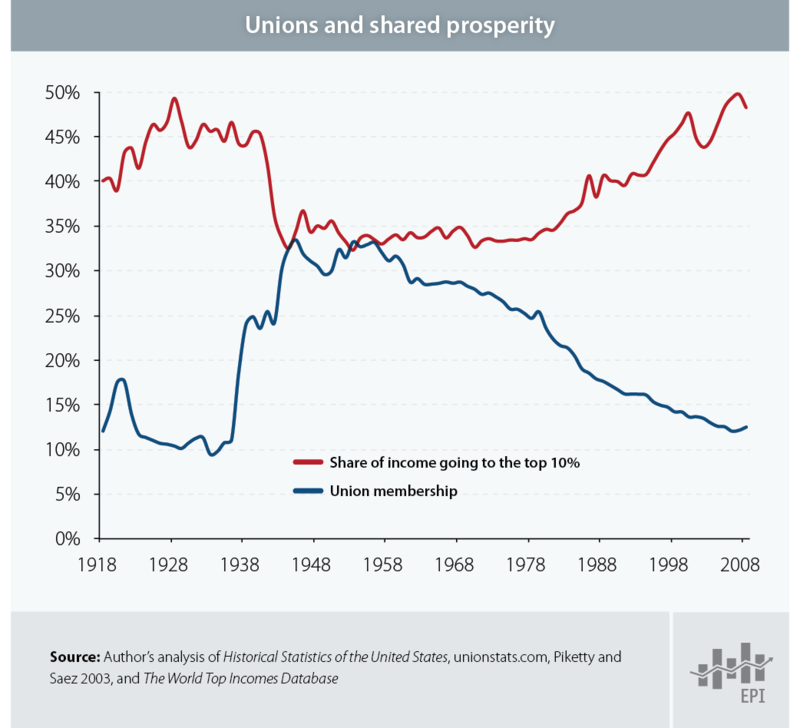 The problem is that Republicans are Big Government for the wealthy and corporations, and nobody wants government for the unions and the poor. See this debate between Barbara Bergmann, Jeff Frankel, Bill Niskanen, and Larry Seidman from 2004 (with a longish intro by Berglund and Vernengo) where the issue is raised. So if Obama wins you get sort of almost anti-Keynesian policies, between the Democratic timidity (let's call it that), and the Republican obstructionism (yeah, that's also a nice euphemism). And if you get Romney, you'll get conservative Keynesianism, tax cuts for the wealthy and spending benefiting certain corporations. Also, two more recent ones on C-Span Book TV taped his talk at MIT on May 7, and his appearance on Bloomberg talking about why need more than stimulus. "In this age of Leontief and Sraffa there is no excuse for mystery or partisan polemics in dealing with the purely logical aspects of the problem." Paul Samuelson in "Understanding the Marxian Notion of Exploitation"
How bad is the unemployment rate? Labor market numbers reported today by the Bureau of Labor Statistics are pretty bad. Only 69,000 jobs created last month, when we would need something more like 400,000 to be in a healthy recovery. But they are actually worse than it looks like, if that is possible. The key to understand why numbers are too rosy is the so-called participation rate. The labor force participation rate is the percentage of working-age persons in an economy who are employed or are unemployed but looking for a job, shown in the graph below. At the peak, from 1997 to 2000 the participation rate was 67.1%, but fell to 63.8% now. If the number of employed and unemployed people that are looking for a job drops the participation rate drops too. If a few of the employed workers become unemployed, but are still looking for a job, the participation rate does not change. But if the unemployed stop searching for a job they drop out of the labor force and the participation rate falls. So you see what is going on. More people are, since the prick of the dot-com bubble in 2000, leaving the labor force. The graph below shows the rate of unemployment and the adjusted rate of unemployment if the labor force participation rate had remained constant at 67.1%. Instead of the current 8.2% rate of unemployment, the adjusted level would be 12.7%. It is also worth noticing that even with the housing bubble the labor market was not very strong during the Bush years, with the unemployment rate never going below 6%.